Gail’s widely appreciated instructional video for midwives, Resolving Shoulder Dystocia, is approved for 2 MEAC CEUs. Purchase your Continuing Education Option below. Resolving Shoulder Dystocia offers practical and immediate solutions for this life-threatening childbirth emergency. Step-by-step, recognize and resolve five types of shoulder dystocia by matching the best from midwifery traditions and modern obstetrics. Learn how the shoulders are stuck and which technique is the right one to free the baby gently and quickly. By far, the most precise explanation you will find on shoulder dystocia. Gaskin’s, Running Start, rotation, and bringing out a posterior arm are here, along in Gail’s FlipFLOP memory tool. See her potentially preventative “Pelvic Thrust.” Understand when McRoberts’ will work — and when it won’t. Reduce panic when you match the technique. 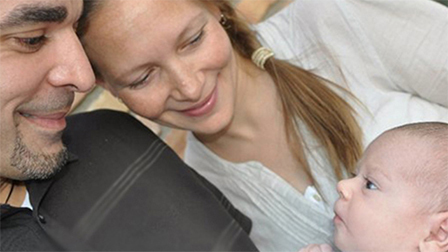 Midwives share stories of how FlipFLOP saved babies without injury and bad outcomes. Practice along with your own doll and pelvis to gain confidence. This is the full video from the 2011 DVD that is no longer in production. Sign into Vimeo to buy this download. You can also, for no extra cost, stream the video from any good internet connection by signing into your account on Vimeo. Watch it on your phone when you have strong internet. Download to the device on which you do your charting to view offline. One download! Download Resolving Shoulder Dystocia here. Download your FREE FlipFLOP PDF by clicking here! Buy a CEU option (below) for $20 via Paypal. Pay via Paypal or your credit card by clicking the “Pay Now” button below. The receipt in paypal is your proof, no need to send a copy but if you do, you save time! Receive your certificate of attendance with Gail’s signature when she receives the posttest by email. Include your name and the date you viewed the video in the posttest for your MEAC certificate. 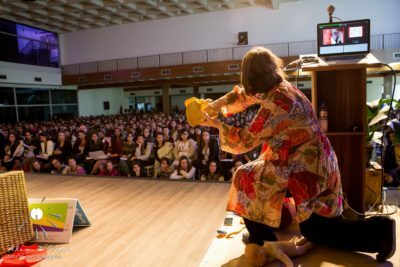 Gail in Brazil at Sia Parto Conference with 800 Obstetricians and Midwives showing the advantage of all fours maternal position so the provider can rotate and remove the posterior arm (especially nice with a female upper body strength). See it better in the studio class video. Gail at MANA showing how all-fours position gives clear advantage in bringing out the posterior arm. (Midwives Alliance of North America Conference, 2010) This is not a scene from the video! Download Resolving Shoulder Dystocia now! 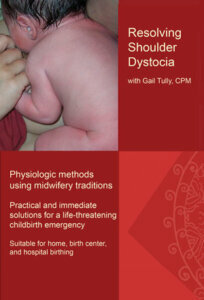 Want to understand how to get 2 CEUs from Midwifery Education Accreditation Council for Resolving Shoulder Dystocia? C. I send back the MEAC (Midwifery Education Accreditation Council) certificate of completion. 3. Prove participation to MEAC with your certificate. A. Save the certificate for your records (print and put it in a folder with ceu certificates for your recertification period). B. I’ll keep a record (for seven years) in case MEAC audits your CEUs with me and other continuing education providers.